Eureka’s call for innovation is open to all professionals actively developing medical solutions to improve the standard of care in health services. This includes: Surgeons, Physicians, Nurses, Critical Care Specialists, Physical Therapists, Chiropractors, Paramedics, Biomedical Engineers, Emergency Medical Technicians, Surgical Technologists, Medical Product Designers, professional Medical Inventors, Amateur Inventors, etc. No one is better suited to identify opportunities for medical advancement and to drive medical breakthroughs than the passionate people, who are actively serving the public in their daily jobs: saving lives, treating disease, preventing ailments, controlling infection, preventing medical errors, reconstructing broken bones and joints, and treating or rehabilitating injuries. Click on Invention Review Registration to present your medical invention. You have great ideas! We’d love to see them! We sponsor Invention Roadshows around the world where medical and healthcare inventors have an opportunity to present their invention to a panel of medical device and healthcare experts at no cost to the inventor. The inventor receives expert advice, development guidance and encouragement from a friendly, professional gathering of opinion leaders in healthcare, medicine, medical product development and device regulation. Jerome H. Grossman, MD, Director of the Health Care Delivery Project, Harvard’s Kennedy School and director/trustee of Mayo Clinic, Stryker Corporation, Penn Medicine and Eureka Medical, among others will chair our panel of expers. Professor Clayton M. Christensen, the thought leader on innovation and business growth at Harvard Business School, Dr. Grossman and Eureka’s management, have developed Eureka’s evaluation criteria. If the invention meets Eureka’s target criteria, Eureka may decide to accept the inventor’s idea for further development and commercialization through Eureka’s network of leading healthcare distributors, advanced medical technology channel partners or venture partners. 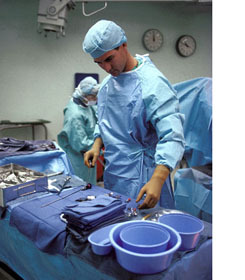 There is no cost to the Medical Inventor for our product development services. Find out how Eureka can be a resource for busy medical professionals: Ideally Suited for Medical Breakthroughs. View Great Idea Advertisement published in professional medical journals globally.